This full colour book by a professional horse physiotherapist is a complete introduction to horse massage. 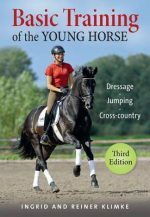 It is a book for everyone who wants to help their horses relax and regenerate after competitions or long rides: horses are very prone to muscular injuries and most owners are keen to keep them in good condition, free from unnecessary discomfort. “Treatment after competition” chapter explains how horses can be relaxed after exertion. Complimentary to Hotline To Your Horse, which focuses much more on pure massage and the physiology of the horse.